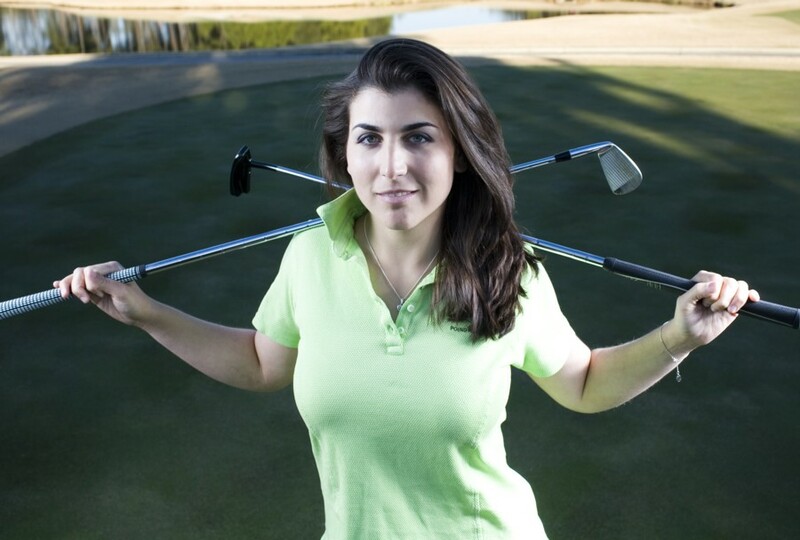 Sandra Gal is a winner on the LPGA Tour. Gal earned her first LPGA victory at the 2011 Kia Classic, outdueling Jiyai Shin in a memorable final-round battle. And outdueling Shin is a really great way to make your first win even more special. A 6-foot tall German, Gal is not a long-ball hitter but more of a finesse player. Her rookie season on the LPGA Tour was 2008 and her previous high finish was fifth. On the money list from 2008-10, Gal finished 68th, 46th and 67th. The photo above, by the way, is from Gal's photoshoot for the "Wilhelmina 7" project (which, as far as I know, is no longer operative). A well-deserved honor for Cristie Kerr at the 2011 Charity Fight Night: She was presented with Muhammad Ali Award for Sport Achievement. Charity Fight Night is staged annually to benefit the Muhammad Ali Parkinson's Foundation. That foundation will get half of Kerr's earnings at the LPGA Founders Cup, should Kerr finish in the Top 10. The other half would go to Kerr's own Birdies for Breast Cancer foundation. The photo above was taken on the red carpet as Kerr arrived for the Fight Night festivities in Phoenix. Congratulations to Henrietta Zuel for winning the Terre Blanche Ladies Open on the LET Access Series. It was the first professional win for Zuel, coming in her first start of 2011, and at age 21. Zuel, from England, is coming off her first full season on the Ladies European Tour in 2010, a year that she ended at No. 48 on the LET money list. Her first appearance on the LET was at age 13 in 2003. She's the 2007 Girls British Amateur champion. The Banesto Tour is a developmental tour based in Spain. Belen Mozo is a Spanish golfer based on the LET and LPGA. Getting in some swings, staying sharp, she entered - and won - the Banesto Tour's season-opener in Cadiz. Mozo, a former All-American at Southern Cal, is a player we'll be seeing a lot more of. 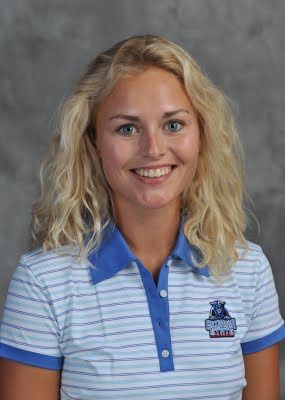 Charlotte Lorentzen, from Denmark, is on the Georgia State University women's golf team. And we're featuring her here because in the second round of the Gator Invitational tournament, she shot a 64. As Golfweek's Lance Ringler tweeted, "Not often we see a 64 in women's college golf, but Ga. State's Charlotte Lorentzen had one in Rd. 2 at Gator Invite." Lorentzen's great round ties the school record, and is only the second round in school history below 68 for a female golfer. To give Lorentzen's 64 some context, I checked the team records for the University of Arizona, a school with a very strong history in women's golf. That 64 is two strokes better than the best college scores of Leta Lindley and Lorena Ochoa, and three better than the best college rounds by Natalie Gulbis and Annika Sorenstam. Continuing with our posts about the Reverb Collective photo shoot involving PGA Tour wives, we come to Melissa Weber Jones. She's the wife of Matt Jones. Erin Walker is the wife of PGA Tour player Jimmy Walker. And yes, this photo is from the PGA Tour wives shoot recently done by the studio Reverb Collective. When these images were first posted on Golf.com, that site implied that all the women featured were angling for a reality TV series. But actually, only a couple of them are. Erin Walker has made clear on Twitter that she has no interest in a television series. "Inside The PGA Tour is the only show the hubby and I will be doing. Reality or not," she tweeted. Check out Erin's blog Tour Wife Travels. It's a great look at life on the PGA Tour circuit. Leon Chen is the fiance of PGA Tour player Vaughn Taylor. This photo is from the shoot that several PGA Tour wives/girlfriends did with the Los Angeles agency Reverb Collective. Liz Estes is the wife of PGA Tour player Bob Estes. This photo is from a shoot that several PGA Tour wives/girlfriends took part in recently. Some (but not all) of those taking part are also interested in taking part in a reality television series focusing on the lives of PGA Tour wives. Liz Estes is one of those interested in a show, and has even had some feelers out about the idea. She told Golf.com, "We were approached by the guys who did Pawn Stars. We talked to them three times, but they never called us back. And then this guy from VH1 asked me to put a show together with the other girls, and I'm like, 'Well, I'm not putting it together.' "
Golf.com also says that Liz is "aspiring pop musician."